When it comes to the flooded LVT market, the products that stand out in the crowd have to deliver on performance, design and overall quality. With a family history in flooring and LVT specifically, I know what it takes to develop stand-out options whether for your home or your next commercial project. With the rise of LVT has come increased competition and unprecedented popularity for a flooring category. I take my products seriously; I am personally invested in LVT and have been since the days before it was a hot term in the industry. Whether fashion-forward design, unparalleled performance, or sustainable attributes is at the top of your list, Raskin Industries has the ideal solution as our product catalog can check all of the boxes. This is the year of what’s next: We are looking forward to the future with new designs, continued success and long-lasting relationships. 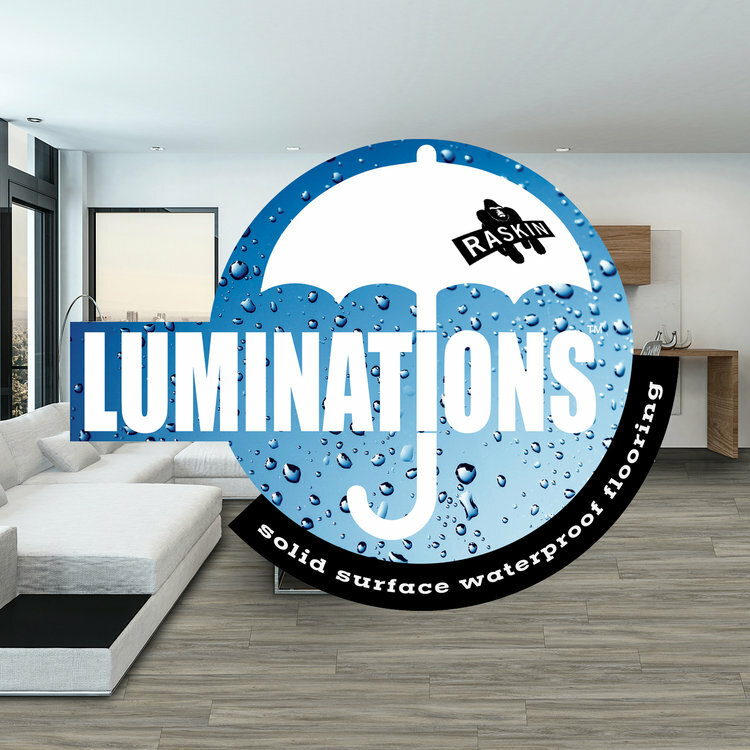 LUMINATIONS by Raskin is another new waterproof line of solid surface floor we've introduced to the market. Along with ACRYLX, Elevations, LOFT and FloorNation, we're bringing a revolutionary approach to protecting your floors from water damage. Coupled with great style and design, we've created a much needed new category of solid surface waterproof flooring and we are committed to continued innovation throughout our products. Re-inventing LVT. One Product Line at a Time. We're proud to announce that our newest LVT floor FLOORNATION is now Made in the USA! Look out for more award-winning, locally manufactured floors by Raskin soon. 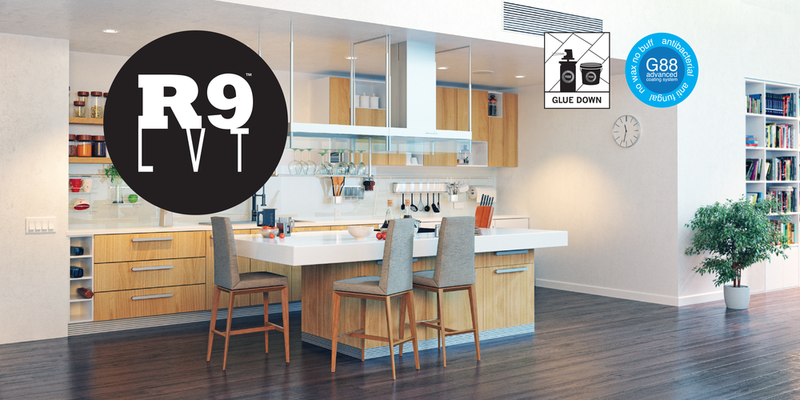 FloorNation features G88 Ceramic Coating System for superior stain resistance, anti-bacterial and anti-fungal properties. With its fashion forward traditional and contemporary designs FloorNation is available in 18 woodgrain colorations that feature a 12mil or 20mil wear layers suited for any demanding environment. FloorNation is easy to install and maintain and is quiet and warm underfoot and is available with or without Bevel and feature sizes in 7.08” x 47.24” and 9.25” x 59.25” depending on the collection selected. Using a non-skid backing and weight from its thick construction, which includes a high grade Fiberglass sheet for stability; it stays firmly in place! It has a strong durable ceramic coating and is quiet and warm under foot. ELEVATIONS unique design allows the planks and tiles to be installed over all types of subfloors including natural wood, concrete, one layer of existing vinyl, ceramic and uneven subfloors. 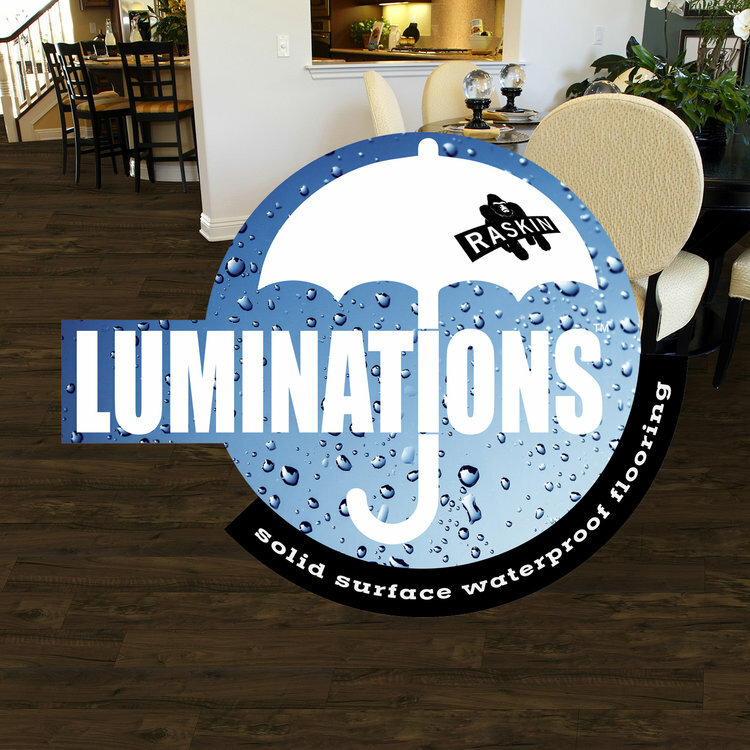 ELEVATIONS is waterproof so it can be installed in moisture prone areas where wood flooring and laminate products would not be used. Three key attributes make Elevations superior to competing floating LVT products. Using a non-skid backing and weight from its thick construction, which includes a high grade Fiberglass sheet for stability; it stays firmly in place! It has a strong durable ceramic coating and is quiet and warm under foot. LOFT unique design allows the planks and tiles to be installed over all types of subfloors including natural wood, concrete, one layer of existing vinyl, ceramic and uneven subfloors. LOFT is waterproof so it can be installed in moisture prone areas where wood flooring and laminate products would not be used. Three key attributes make Elevations LOFT superior to competing floating LVT products. Formations Luxury Resilient Flooring is available in 5 collections featuring our Best, Better and Entry level specifications. With its tough G55 Ceramic Coating System for superior stain resistance and no buff / no wax properties, Formations is ideal for your home and commercial applications depending on the collection selected. 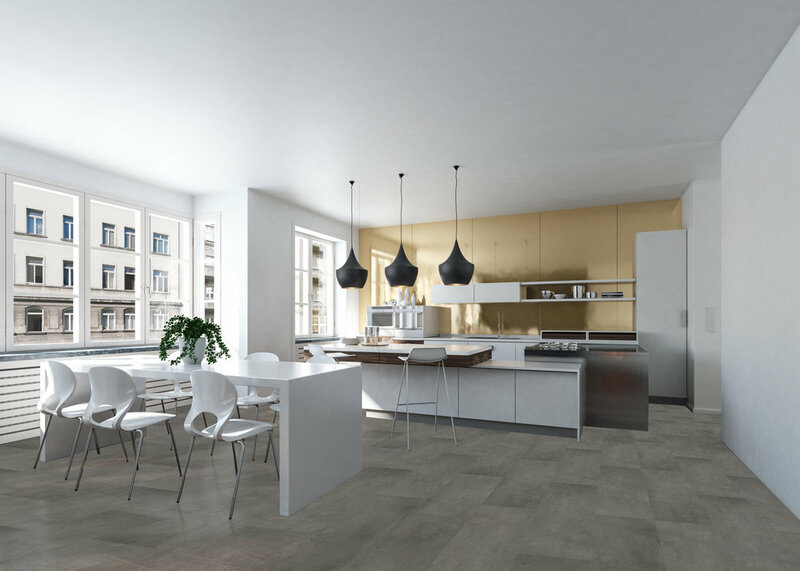 With its fashion forward traditional/contemporary woodgrain, concrete and stone designs that feature a 2.0mm-3.0mm gauge and 6-20 mil wear layers that is easy to install and maintain and is quiet and warm underfoot. Elevations INTERWOVEN Tile offers a stylish, durable and easy to maintain alternative to carpet tile. Elevations INTERWOVEN Tile’s engineered TOP surface delivers a premium woven texture available in a multiple of stylish colors, proven not to fray when cut and is extremely water resistant which makes itpractically indestructible. Another great feature is that Elevations INTERWOVEN Tile can also be combined with Elevations best selling 5mm gauge range LLT Range including Prima, Provence, Studio, Tusk and Modern Ceramic to create more flexibility in designing a unique and stylish space. Available in 9 different collections - 39 colorations - featuring a 28 mil wear layer. Phthalate-free and environmentally friendly. Here are some photos of floor installations using Raskin Gorilla floors. Browse through the photo gallery to get some inspiration and feel free to contact one of our experienced customer representatives to talk about the unique design and features of our award-winning floors. If you are an existing customer, we'd love to see photos of some of your installations too. Please send them to us to feature on the site.